When I was a child I used to play a game with my sister where we would say a single word (like rainbow) over and over again. Something strange happened when we did that. After a few minutes of repeating the word, we lost the ability to say the word properly. The word had lost its meaning and became alien sounding. Fast forward 30 years, and I found the same thing happened when I tried to name my first company. Repeatedly thinking about the same words creates an inability to judge if words sound good or right or even suitable at all. Psychologists have an explanation for this. They call it semantic satiation. Apparently, it happens because your brain cells fire repeatedly when you say the same word over and over. First, the network of brain cells slows down then wears itself out and eventually shuts down temporarily. I recently discovered another way of completely burning out your brain when it comes to naming a company. Simply try and use a company name generator like NameMesh. You type in a word and it will suggest endless variations most of which are utterly useless as company names. Even if the long list did contain a suitable candidate, semantic satiation will ensure that you won’t be able to identify it. It’s a giant haystack and a needle may or may not be in there. Luckily there are better ways of producing a suitable company name. I think the best way of coming up with a great company name is to generate lots of good possible candidates from which you select THE ONE. You may think just finding one name is heard enough. But let me show you how you can come up with lots of different words that you can ponder and integrate into your name. But first, let’s think about what we are trying to do. Why do we need a good company name? A good company name gives a good first impression, helps with discoverability, and helps potential customers to form an emotional connection and memorise us. No emotional connection and your name will blend into the 5000 or so marketing messages we are exposed to every day. So how do we find a name that stands out? And in a good way, that’s the key. In my previous post, I explained why branding is so important and that branding is not just about visual signs. The most important parts of a brand are emotional clues and meaningful words which make the brand relatable. This means to find a good company name we need to find words that are related to the company or brand we want to create. First, think about your customer. What do you want your name to communicate to your customer? A good company name should explain or at least hint at who you are and what you do. 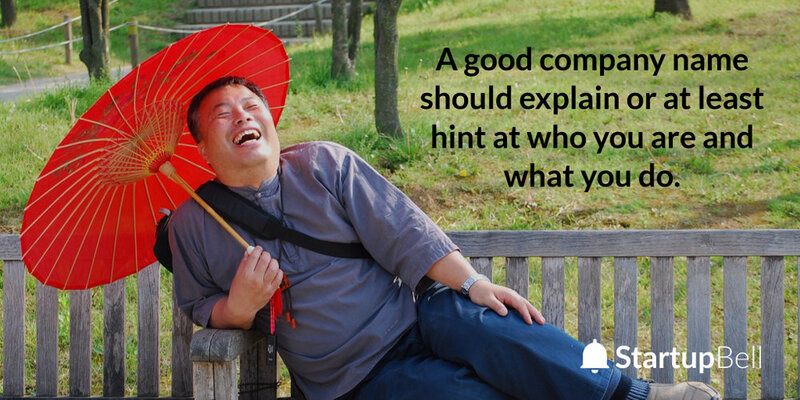 The more obvious it is from your name what your company does, the less you have to explain to customers. Having the right words in the name can produce meaning and create trust. So start by building a list of words that explain what you do. Don’t dismiss anything at this stage. Try to really hone in on words that describe you and the promise you make to your customer. Words should be relevant to your industry, but distinguish you from your competition. It is useful to think of the niche you are trying to serve as well as the unique expertise you can offer. But beware that if you create a name that is too specific, it could hamper your longer term developments. For example, if you name your company WeBuildSheds Ltd, the customer will instantly understand what it is you do. But if you decide to branch out into building glasshouses a few years later, your name may pose a problem, especially if glasshouses become your major source of income. Only you know if you are likely to stay within a defined area, in which case, be explicit. Be less specific if your ambitions are to start niche but grow into new industries. Steve Jobs had a good inkling that he would outgrow a company name based on computers quickly. He could have called his company AdvancedComputers Inc, but instead he opted for Apple. If you are unsure about your expansion plans, words that are not associated with a niche are a better option. Think of words that are only associated with the customers you want. 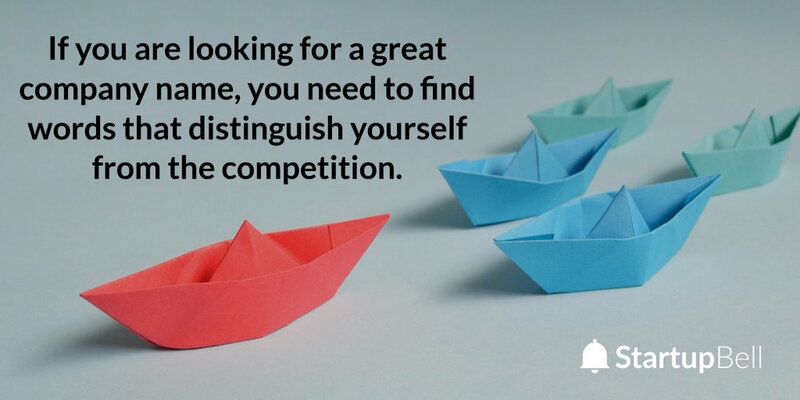 You need to find words that distinguish yourself from the competition. If you want to stand out, you have to be willing to appeal to the few at the expense of the masses. You can’t be a match for everyone. The right company name allows you to communicate exactly who you want to appeal to. The current trend away from descriptive names towards completely made up words is simply laziness. It’s true that the most obvious word combinations have gone. But try hard to find words that conjure up positive images and memories in your wanted customer. It will save you a fortune in marketing later. Companies that take the easy option of going with a made up word have the early advantage to start with a clean slate, but they have to work hard later to form an association between the made up word and their brand. A descriptive name will do the heaving lifting for you. Your company name needs to appeal to the people you want to serve. It is hard to find a company name based on a word or a word combination that is unique. In an attempt to find such a word some people have gone to great lengths. But overthinking is rarely helpful when there is no instant connection to a word. Potential customers will not have followed your thought process. They may be clueless until you explain the meaning of your company name to them. This could be an ice breaker. But most of the time, people simply won’t care enough to ask. So here is a short list of things not to do when you name your company. Don’t create names from foreign words. That’s unless your desired audience instantly understands the word because it is in common use or your audience is foreign. Don’t use words or names backwards. Unless you are Oprah that is. Harpo Productions sounds quite good actually. Don’t misspell words. Misspellings can work in certain markets, think of Lyft or Tumblr. But more often they just look immature. Also, your company may always be associated with a certain era. The names iPhone, eBay and oDesk were all created in a short span of time. Don’t use words that are difficult to pronounce. People won’t share these names with others as often as easy to pronounce names. (“You should try this new restaurant called…erm...I don’t know how to pronounce it… Caipirinha.” versus “You should try Yo Sushi”). Unique words that don’t have any meaning are difficult for customers to grasp and remember. Words that contain part of the word they are hinting at are an exception. For example Acuvue: Acu as a short form of accurate is instantly recognisable. No startup can exist without an online presence. Yet many startups are not sufficiently clued up on search engine optimisation to realise that the name is important when Google decides how highly to rank you in a search. Luckily, branding and SEO are complementary when it comes to naming a company. The rules that satisfy search engines will actually help you hone into a better name that works with your branding. Moz did a great presentation on SEO and domain names. Just bear in mind that the presentation was not specifically about startup situations. When you choose a company name you want to make sure that you can get a domain name that matches your company name, because it helps to build a strong brand. Your internet “address” or URL will consist of the domain name and an extension (.com, .org, .net). For a startup, THE most important consideration is whether or not the .com domain is available. The .com suffix gives the appearance of being established, it creates trust and means you are a “proper” company. Other extensions (there are now over 300) have less of a reputation and some have been associated with spammy sites, so definitely avoid the domain extensions .ninja, .info, .biz and .name. Do not choose a company name if .com extension is already taken. It means someone else has got the name first and may use it in the future. The gold standard is .com. If you can’t get it, you are better off going back to the drawing board. Given the importance of your online presence do not feel tempted to opt for domains which are not exact matches of your name. Some companies have opted for a modified domain with words like “join”, “buy” or “get” before the name. This dilutes your branding efforts as customers will get confused what your real name is. As a startup you don’t need to compromise. Since your name has no associations yet you can afford to be choosy. Finding a name with available .com, as well as available Facebook page and twitter handle will save you countless marketing dollars later. You can check the availability of a domain plus all important social media platforms in one place at namecheckr.com. Don’t use hyphens. Hyphens are confusing, not easy to remember and use up space. They are also associated with cheap, spammy sites. Don’t use numbers. Again they are associated with cheap brands like Phones4u. Don’t use AND. “And” can cause confusion in how it is spelt. It could be Marks&Spencer, MarksAndSpencer, Marks+Spencer or Marks and Spencer. The problem is that google sees each spelling separately, so instead of ranking you on 100 visitors that search for your site using your name, google sees 25 visitors per search, effectively diluting your SEO efforts. Keyword ranking depends on how many people searched for one exact term, even though all of them would end up on the same page. Keep the name short. It allows you to display the company name in page titles which helps your branding efforts. Keywords are now less important than they used to be since google learnt to attach meaning to words instead of returning the accurate search related to keywords. If important keywords are in your name, great, it won’t do any harm, but don’t lose any sleep over it. Make your name easy to spell. Don’t risk missing out on referrals (i.e. links) from other sites, because they couldn’t spell your name correctly. If you want to trademark your company name you face a completely new set of challenges to your naming strategy. Whilst good branding and SEO seek descriptive words that fit into your industry and express what you do, trademark law prohibits these exact words. I have written a separate blog post on trademarking to keep this article simple. If you are planning to trademark your name please read it, because it will give a few more options than I am about to suggest here. Trademark law has a term which is extremely significant for startups thinking about a company name. The term is “inherently distinctive”. If a word is inherently distinctive it means the word has no meaning to the public at large. The word only exists because it is used in relation to certain goods and services. E.g., Kodak, the word Kodak had no meaning before the company used it to sell films and cameras. An inherently distinctive word will not be found in a dictionary and is the easiest to trademark. However, this does not mean the word must be devoid of meaning to your customer. Pinterest is a great example. The word Pinterest was created from the words pin and interest. Pinterest instantly conveys meaning, yet in trademark terms, it is inherently distinctive, because the word did not exist it was specifically created as a word to describe a social media platform. If you are able to combine words in a meaningful way, which are new to the world, you will make the trademarking process super simple. Don’t use any geographic terms in your name, eg CambridgeBuilders. It would disadvantage other builders in the Cambridge area that want to describe themselves as builders from Cambridge, so the intellectual property office responsible for trademarks won’t allow it. Words are also not registerable if they imply value or quality, so CheapSheds would not be allowed. Trademark law is fairly complicated. For example, a word or combination can acquire distinctiveness through use. However, as a startup, you are far better of finding a name that in trademark terms is inherently distinctive. It makes the trademark process simple to the point where you will be able to register the name yourself. You may not want to trademark your company name. But hopefully, after reading this article, you will be aware which words are likely to make the trademarking process harder in the future. Once you have created a long list of words to possibly include in your name, give yourself time to play around with them. Combine them in different ways. There are two ways in which you can combine words to create something that is unique and meaningful. The first is by creating compound words, which are just two words joined together. Examples are Facebook, Fitbit or Firefox. Another option of combining words is by creating a portmanteau. A portmanteau is a fused word like smog for smoke and fog. Examples of company names that are portmanteaus are Dulux which came from Dupont and Luxury; Microsoft which contains microcomputers and software; and Barclaycard which originated from Barclays and credit card. Allow yourself to sleep over your name ideas. It’s amazing how much our brains work when we’re asleep. You might wake up in the morning with another great name possibility for your company. I have one final tip for you before you go ahead with registering. Don’t leave it too long between identifying a great company name and registering the available .com domain. I have come across a number of instances where a great name suddenly disappeared from the available options because it was snapped up by unscrupulous domain registrars. This practice is called “domain name front running” and occurs when an organisation monitors company name searches in order to select good available names to sell later. I recommend to do your domain check on GoDaddy, because I'm certain they don't partake in this practice. But do be ware that about 100,000 domains get added every day. If you find a .com with your exact name choice available grab it. If you decide not to use it later after all, you only lose about £10.00 for registering the domain for one year. I hope this article has motivated you to create a name for your company by yourself. If you are still unsure exactly how to get started, email me and I will take you through the process.